Surrounded in mystery, is a place that experts all over the world are still trying to understand — Teotihuacan. It's one of Mexico’s largest, and most mysterious archaeological sites. With the third largest pyramid in the world being found here, a visit to the pyramids of Teotihuacan is a trip not to be missed. Located just 30 miles northeast of Mexico City is the ancient Mesoamerican city of Teotihuacan. It's among the top things to do in Mexico and for those visiting Mexico City, a trip to this UNESCO World Heritage Site is an absolute must. You can take the short trip by chartering a bus or taxi, or opt for a more relaxing tour. Although a tour may be a pricier option, we recommend going this route because of the valuable knowledge that the tour guides are able to provide. Olympus Tours offers great Mexico City excursions, such as the Pyramids of Teotihuacan and offers the Shrine of Guadalupe as a bonus. They pick you up from your hotel, allowing you the opportunity to enjoy breakfast beforehand and not have to scramble looking for the bus terminal. Once getting picked up, you'll get to mingle with fellow travelers and like-minded explorers. The first stop along the tour happens at the Plaza de las Tres Culturas. This is the architectural site of three cultural facets. The Aztec pyramids of Tlatelolco, the 17th-century Spanish Templo de Santiago and the modern Centro Cultural Universitario. 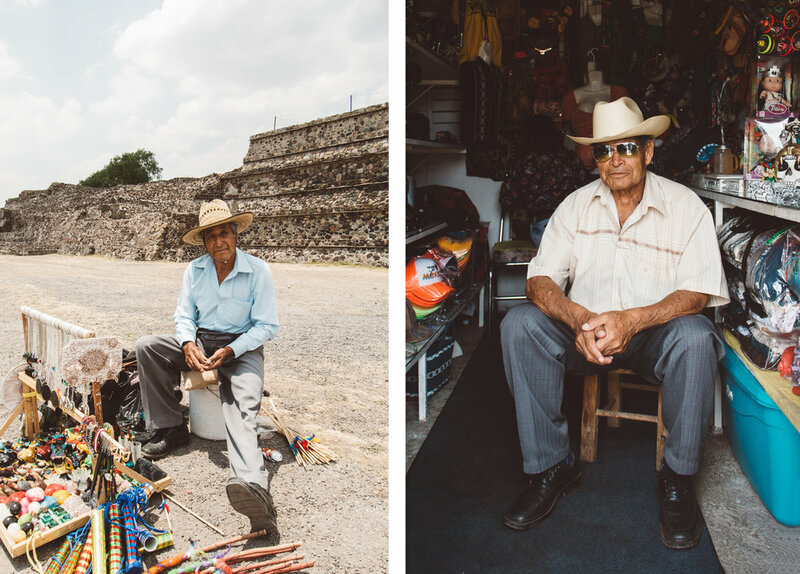 From here it's about an hour drive to the town of San Juan Teotihuacan, where you'll make a pit stop and learn some of the history behind the first people to settle in this area and how they were able to thrive in society. You'll also get to sip on tequila at 10am... because why not? If you would prefer to do it on your own and not have shots of tequila at 10am, you can take a bus to the pyramids from Mexico City’s northern bus terminal. The bus leaves every 30 minutes and takes about an hour to get there and an hour to get back. The roundtrip ticket costs 90 pesos (about $5USD). The bus will drop you off at Gate 1, where you’ll purchase your tickets to enter the park at 65 pesos each (about $4USD). Teotihuacán, meaning "The City of the Gods” in Nahuatl; was the most important and largest city of pre-Aztec central Mexico. At its peak (500 CE), it covered an area of about eight square miles and supported a population estimated at 125,000–200,000. Making it one of the largest cities in the world at the time. It was also the region’s major economic as well as religious centers. Designating it a UNESCO World Heritage site in 1987. From the minute you arrive to the pyramids, you'll stroll past a few different vendors. All selling souvenirs and hats. It can get very hot and there's little to no shade, so either bring a hat or purchasing one from the vendors is highly suggested. Once you make it past the entrance, you'll be told the history behind this sacred place and stroll through some of the many ruins. Running on a north to south axis is the city’s main street, known today as the Avenue of the Dead. It runs for more than two miles and contains three major pyramid complexes. At the northern end of the avenue is the Pyramid of the Moon. Research suggests that it was built between 1 AD and 350 AD. It started off as a small platform and eventually became a 150-foot-high structure. The platforms at the top were likely used for rituals that could be witnessed by people on the ground. Tombs found within the structure contained both human and animal sacrifices along with goods such as obsidian and greenstone. Less than half a mile south of the Pyramid of the Moon is the Pyramid of the Sun. At a height of more than 200 feet, this pyramid is known as the worlds third largest pyramid behind the two Egyptian pyramids of Giza. It was completed around 200 AD. Since than several discoveries have been made, such as small treasure troves of offerings that may date back to when construction of the pyramid began. Jose our tour guide provided by Olympus Tours, did an amazing job at sharing the incredible history behind this majestic place. Everything was explained in great detail, and provided the perfect amount of time to roam and explore the pyramids. While roaming around the pyramids, you'll notice that there tons of vendors. Which makes sense, after all this is a major tourism attraction now. Many of these vendors are selling small trinkets, blankets and even refreshments. Making a purchase from them not only gets you a memory of the trip to take back home, but it also helps stimulate the local economy. They can sometimes be persistent... like anyone trying to make a sale.